I don’t always sleep well in a bushwalking tent. Certainly my Thermarest is good, but it’s not a mattress. My pillow is a lumpy, makeshift bundle of things I’ll be wearing in a few hours. And a sleeping bag takes its own getting used to. But at the end of a day, hard walking has its effect. It joins with the occupied silence beyond – calling birds, stridulating crickets, shushing or rushing wind and water – to lead me by the hand into that strange land that is sleep … Until the sounds of tearing, growling and crunching yank me awake. Something is invading our tents! 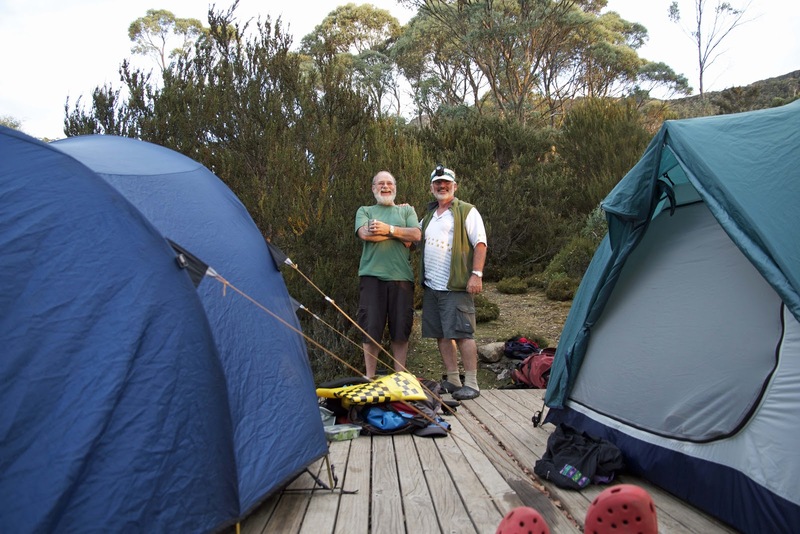 We’re on camping platforms at Wild Dog Creek in Tasmania’s Walls of Jerusalem National Park. But this is no wild dog. It’s a pair of common brushtail possums (Trichosurus vulpecula) under Jim and Jeff’s tent flap, squabbling over some carelessly hidden morsels. The neighbours show no signs of attending to their marsupial visitors, so I struggle out of the tent – not in the best of moods – and hoosh the beasts away. I do a bit of my own growling at the neighbours, shove their raided food scraps back into their tent, and struggle back into my sleeping bag. Ten minutes later, just as La La Land is welcoming me back, the possums return. This time Jim and Jeff respond, and have a better go at hiding their food. About every ten to thirty minutes thereafter, our furry friends return, eventually invading our tent too. At one point I tetchily shove my hand towards a possum that’s snuffling in our vestibule. I connect direct with its nose – not hard – but we’re both equally surprised. It’s still no deterrent. The possums keep coming back until Tim and I, and Jim and Jeff next door, haul our packs inside our tents with us. They finally give up, and leave us to find the long road back to slumber. I travel there via the path of pondering. My initial thoughts are grumpy ones. 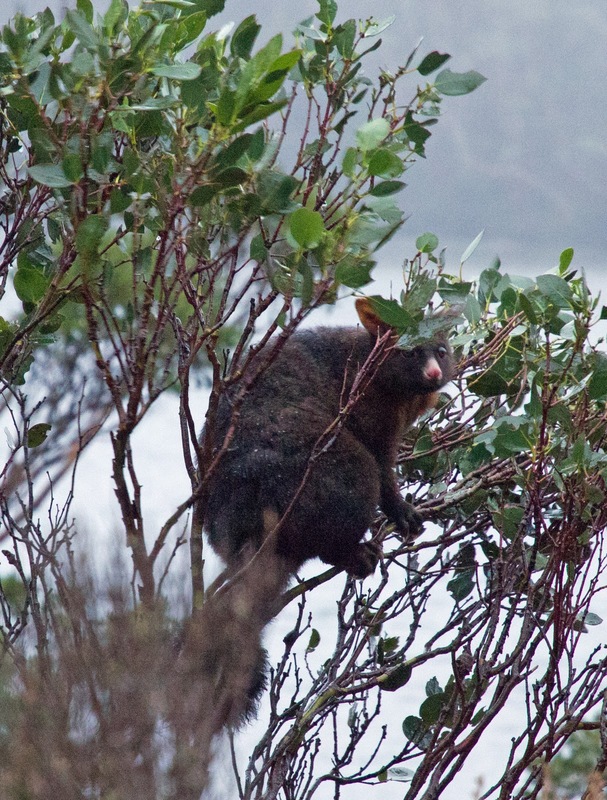 These possums are just plain nuisances that have “invaded” our space. Of course on reflection, we are the interlopers. And as I think about my wider experience of them, I can’t help admiring their amazing adaptability. True omnivores, they supplement their mainly vegetarian diet with almost anything else they can find. In New Zealand, where they were introduced in the 1830s for the fur trade, they have been observed eating eggs, birds and even reptiles. But their incredible versatility isn’t confined to diet. They are native to virtually every part of Australia, varying their diet, size, fur colour and breeding behaviour to suit local conditions. With a gestation period of less than three weeks, they can respond to favourable conditions by breeding rapidly. They are one of the few marsupials to have adapted well to the introduction of humans. 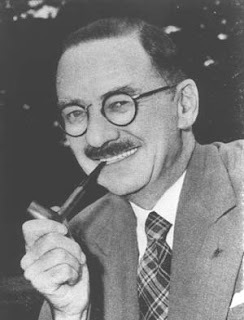 Crosbie Morrison, an Australian naturalist and broadcaster of the 1940 and 50s, made this apt, biblical-sounding pronouncement about brushtail possums. When man came on the scene and destroyed the bush and made gardens, and the other animals went away, the possum stayed and tasted the new things that man had brought, and found them good. 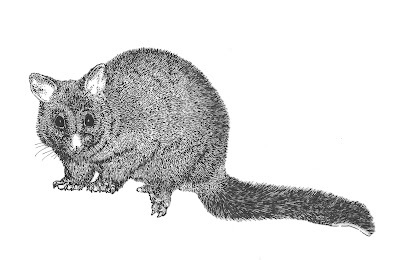 Morrison, a man of his time, used words like “primitive” to describe marsupials like the brushtail. Although he greatly admired them, he couldn’t help emphasising what they “lacked” in comparison with placental mammals such as cats and dogs. As I think back to an earlier possum-punctuated sleep in the bush, I’m not sure I agree. On that occasion a “brushy” had slipped under my tent vestibule, found my pack, unzipped the top pocket, and carried off a number of zip-lock plastic bags. One of those bags contained a book, Christobel Mattingly’s biography of Deny King, called “King of the Wilderness”. I found it under a bush the next morning. I don’t know of any cat or dog that could have mounted that raid, especially one involving such a dexterous unzipping. To this day the book bears possum bite marks. They prompt me to ask: who is the real king of the wilderness? Peter, good tale. I recall being camped on Maria Island once. There was something making the tent vibrate, and I then realised there was something snuffling near my hip along the side of the tent. I tapped it (I think it was a tap...) and it stopped for a short while but returned. After several goes, I turned a light on, to discover that I had very stupidly popped a couple of squares of foil-wrapped chocolate into the mesh pocket in the side of the tent "for later". A possum had located it and was sucking the chocolate through the tent-inner material. It had done quite a good job, and I had chocolate attached to the side of the tent with possum saliva. To get some sleep I had to detach it, dispose of it and wipe up the tent as well as possible. There's still a slight stain there. They are certainly adaptable. Thanks Mark - great story. Hard to resist the "sucked in!" dad joke/pun in response to that :-) We Aussies always seem to have a possum story, and also a huntsman spider story.